Reg, Wilf and Cissy are retired opera singers who often worked together in the past; among other residents are Cedric Livingstone, a former director, and diva Anne Langley. All the guests in the retirement home continue to be engaged in their former professions in one way or the other, including lecturing and initiating young people to music. Finances threaten closure of the home but proceeds from a yearly gala concert on Verdi's birthday hold hope for a continuation of the place. However, Cedric has been rather desperate due to the fact that some of the most prominent singers have either died or decided not to participate at all. Reg, Wilf and Cissy, were in the cast of a very highly rated recording of the opera Rigoletto, which includes a famous quartet for soprano, mezzo-soprano, tenor, and baritone. This version is very prominent amongst opera buffs as THE Rigoletto of the post-war era. A slow yet captivating movie and I'm loving it. 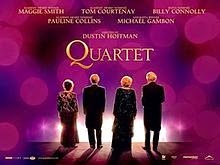 Really enjoyed this movie drama with so many experienced, elderly actors. Totally surprised it was directed by Dustin Hoffman! Worth watching with other similar taste friends.